1. 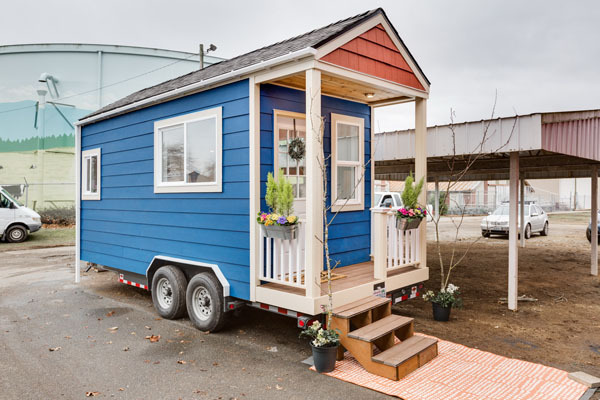 Green Building Headquarters & Tiny House Tours, 1000 N. State St.
2. Chuckanut Center, 103 Chuckanut Dr. N.
3. You Look Radiant, 1416 16th St.
4. Kingsmill, 1060 Kingsmill St.
5. Wild Acres Farm, 1779 E. Smith Rd. 6. Harvest House, 9498 Stein Rd. 8. Kitchen Liberation, 914 Liberty St.
One thousand N. State St. has a history of reuse. 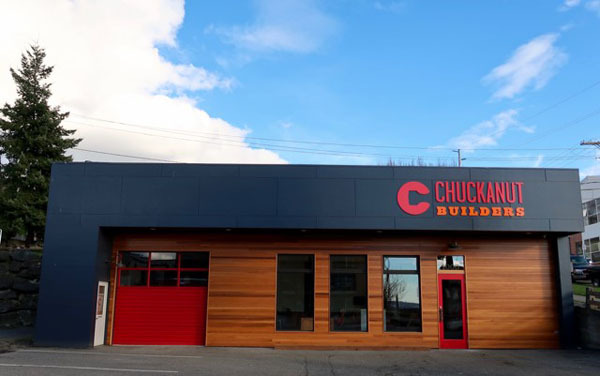 A 1900 mixed use building gave way to an auto body shop in the 1940s; and is now the headquarters of Chuckanut Builders. The historic nature of the building and history of reuse is a natural fit for a company like theirs. 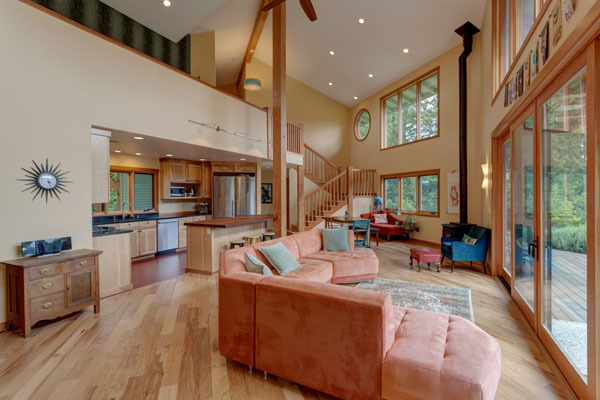 Chuckanut Builders are well versed in the practice of reimagining spaces, embracing both the design opportunities and working with the challenges like limited light and an inefficient building. If you look closely, and have a tour guide, you can see remnants of the building’s past life. They embraced the high ceilings, waterproofed and refinished the existing concrete floors, and painted the exposed concrete walls. Starting a project can feel daunting but it doesn’t have to. This is the perfect time to pick a green building expert’s brain and visit some tiny homes, too. CAZ Insulation & Energy Services built and donated a tiny home to Kulshan Community Land Trust and soon it could be yours! Buy your $25 raffle tickets at this stop for a chance to win! 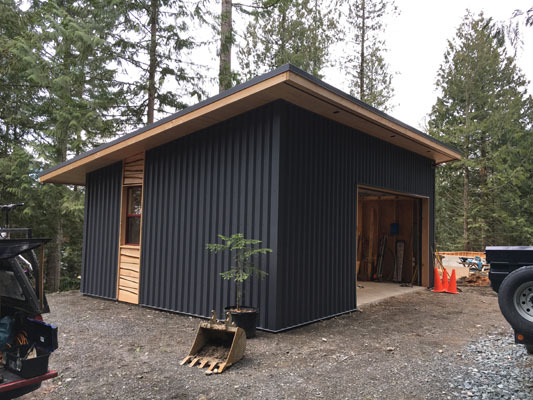 Tour this house along with a tiny house built by Evine Tiny Homes with contemporary styling, full hookups, energy efficient materials, and SIP panels. 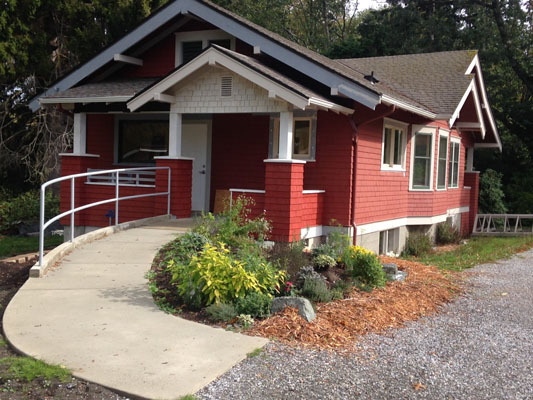 The Chuckanut Center was born from a desire to create a community hub on the south side of Bellingham for people wanting to learn how to live a more resilient and sustainable life. Formerly the old Fairhaven park caretaker’s house (built in 1914) and rose garden, the 2.5 acre property has an interesting history focused on serving the community of Bellingham and travelers in need of lodging. Unfortunately, the house became tired and neglected and was slated for destruction, but in 2008, a group of motivated citizens formed a non-profit and began to rebuild the old caretakers house. 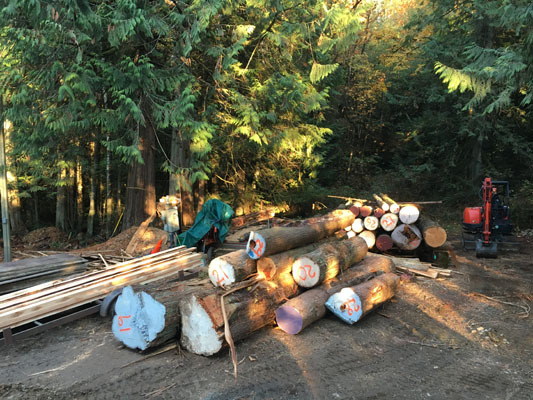 With largely donated labor, supplies, and skills this historical asset was saved. Construction was complete in the spring of 2017. 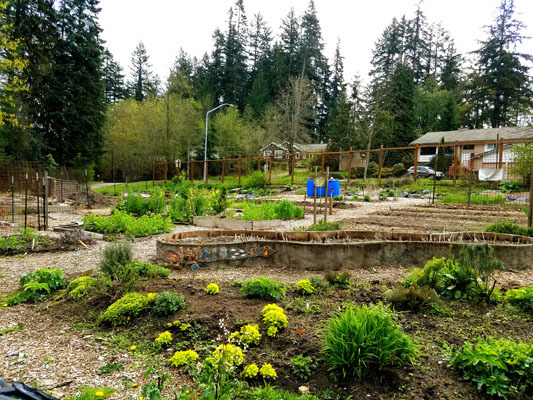 The Chuckanut center is working to create a community hub where people come together, learn, and share skills to create a network of like-minded members. Tour the demonstration and community gardens, learn the history, and see the renovation! Please park in Fairhaven Park and follow the signs/sidewalk to the Center. Living close to the library, grocery store and all that Fairhaven has to offer was important for the owners of You Look Radiant. 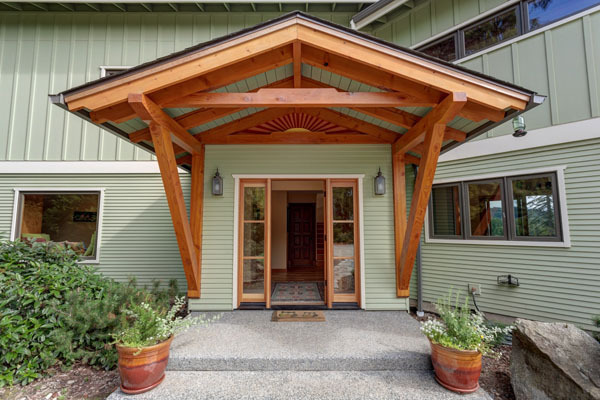 Years in the making, this home was designed for Tom and Shila as their forever home using Universal Design for aging in place. Working with local experts, Aiki Homes, this house has been built to last, with low energy bills and sustainability in mind. You Look Radiant was built with super airtight construction, high efficiency insulation, and a rainscreen for a superior shell. The radiant heat system combined with a heat pump will provide not only efficient heat and hot water, but a comfortable space year-round and warm toes! 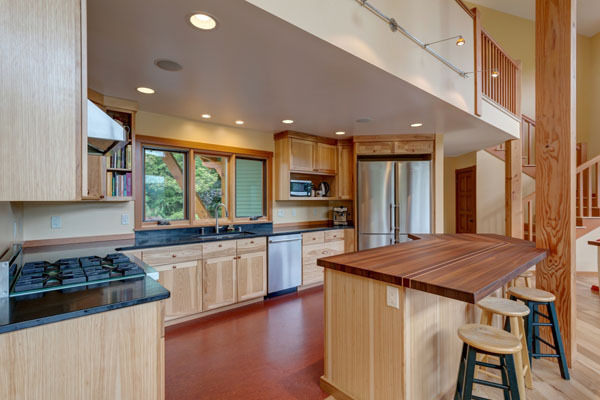 Low impact finishes include recycled material countertops, cork floors, and low toxic materials used throughout. Outfitted with a rainwater catchment system, the landscape will stay green all year long and help to keep water bills low! A durable, efficient, healthy, well designed, affordable home in the woods crafted with a DIY attitude. The homeowners and builders, Chris and Hilary, knew they wanted to build a modest and super-efficient home as they searched for a property to connect with and build on. 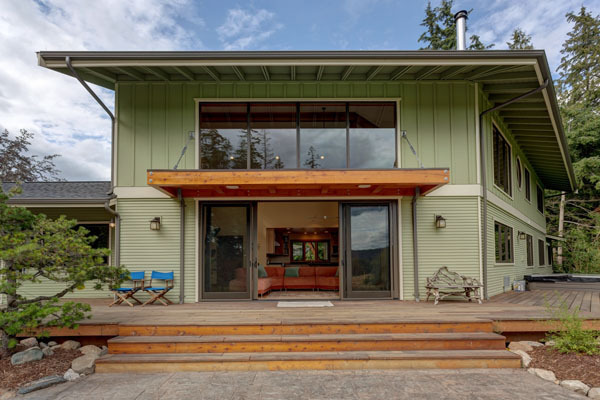 Inspired by the large trees that dominated the landscape, the owners incorporated some of the beautiful trees into their design, including Cedar for siding and exterior finishes, and Maple and Fir for floors, stair treads, handrails, and trim. This project is in mid-construction and will give tour goers a “behind the walls” look at deep green building. 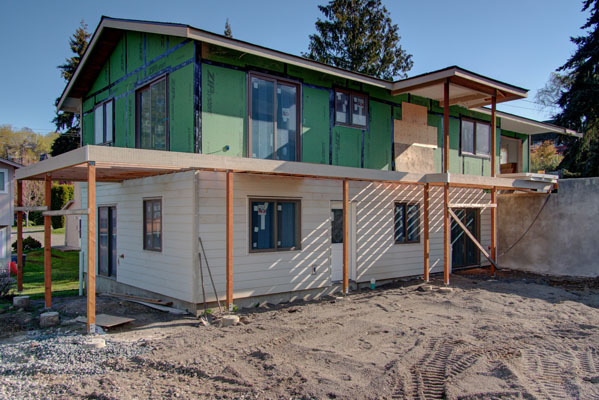 See how framing can be improved to help increase energy efficiency and learn about the innovative mechanical systems that deliver the most efficient heat and clean air. Kingsmill is an incredible opportunity to see what is typically hidden in a green home. The vision the owners held for this property is perfectly captured in one phrase: long term sustainability. 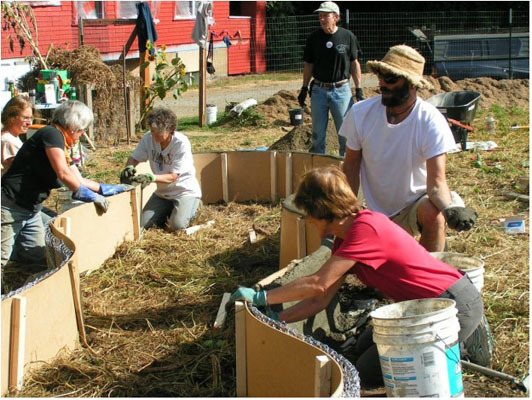 The site includes an extensive deep green remodel, a landscape redesigned using permaculture techniques, and the development of a nano-scale family farm. The remodel revolved around salvage. The former roof structure was rescued for re-use and recycled framing materials were used as often as possible, including the main ridge system and front porch. The original deck was also dismantled and rebuilt for a beautiful outdoor living area. With a specific focus on indoor air quality, Wild Acres has exceptionally efficient heating and ventilation systems. 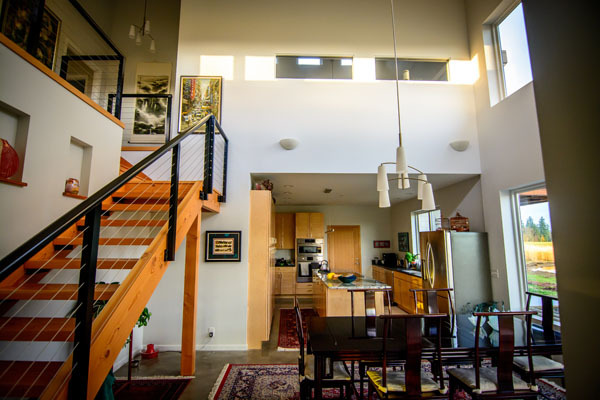 Passive solar techniques such as ample natural light and large roof overhangs increase energy efficiency, while a large solar array provides abundant power. The surrounding acreage has been completely re-envisioned with a focus on permaculture and sustainable agriculture. The family farm has become a premier source for pasture raised, locally sourced food, where animals live in small batches and have extensive access to fresh pasture. The Harvest House owners are living their dream to create “low carbon local produce,” grown organically! The house was built with a large deck overlooking the patio, a separate canning kitchen, cold storage pantry, wine cellar, media room, and a solarium. Scenic views of Mt. Baker abound, and are a highlight for visitors staying in the agri-tourism focused guesthouse located on site. 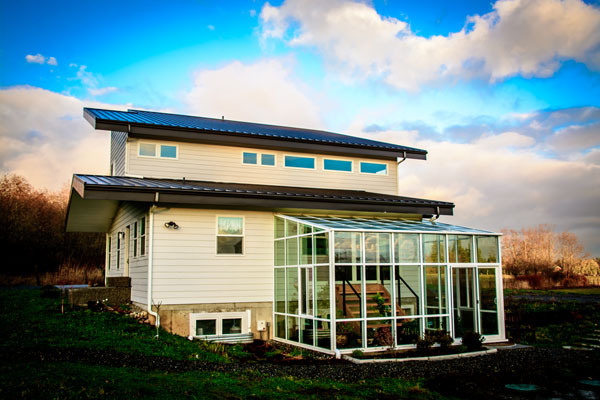 As the United States most northerly Net-Zero Energy residence certified by the International Living Future Institute, Harvest House is highly energy efficient. It takes full advantage of natural lighting and prevailing winds, allowing winter sun to penetrate deep inside but providing cool shade for summer. In addition, an 18kWh solar array provides all power used on the farm. The solar array, edible landscaping, open floor plan, high vaulted ceilings, and abundant natural lighting contribute to a design that “harvests” wind, water, sunlight, and soil, and gives Harvest House its name. 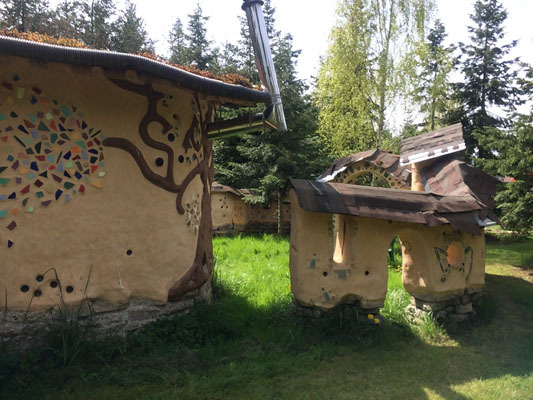 Don’t miss the Cob Cottage built in a Christmas tree forest! 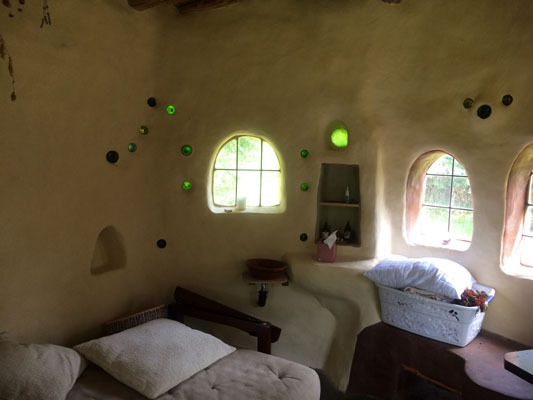 The low-impact method of packing clay-rich earth, straw, and gravel allows direct sourcing from the building site of a cob structure. The cottage was built from on-site clay and urbanite (broken concrete) and made use of timbers from the property. 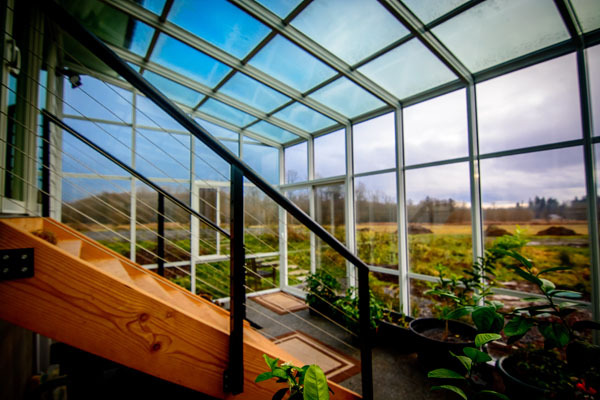 Most of the materials were reused or salvaged: roof rafters and carpet were reused, on-site plants were transplanted for the green roof, windows came from the RE Store, glass bottles were pulled from household recycling, and glass inserts in the walls were picked up at craft fairs. 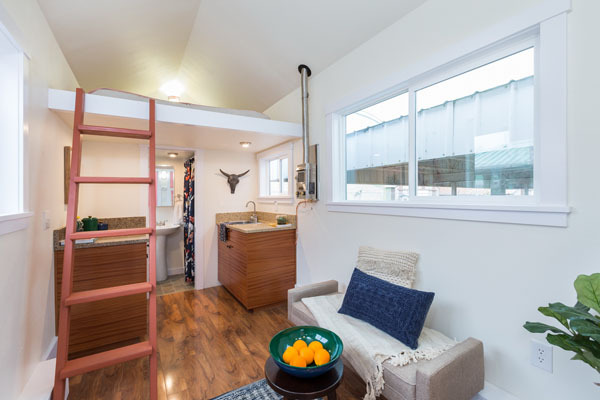 The cozy 200 square foot floor plan holds a bed, window seats, table, sink, and woodstove. Peek in to see the mixing, building, and shaping techniques in action. 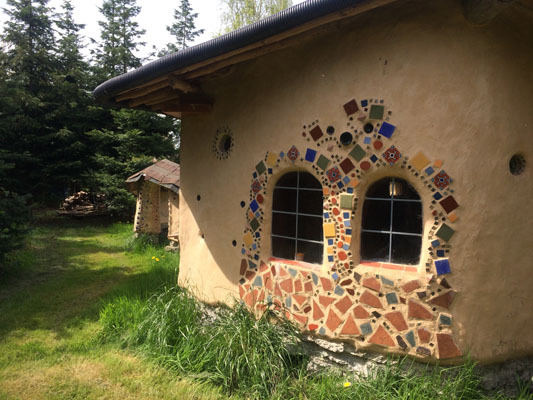 The cob medium can be formed to any shape and with a variety of finishing options, it has limitless potential for organic, artistic expression. The ground can be quite wet, depending on the weather, so boots may be appropriate! 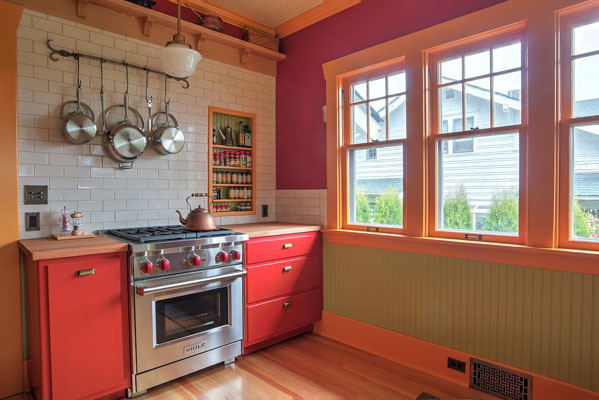 This complete kitchen and bathroom renovation was inspired by the Craftsman era and includes many details true to the 1916 home. The Challenge presented to A1 Builders & Adaptations Design Studio was turning a small kitchen space into one that made cooking feel good again. 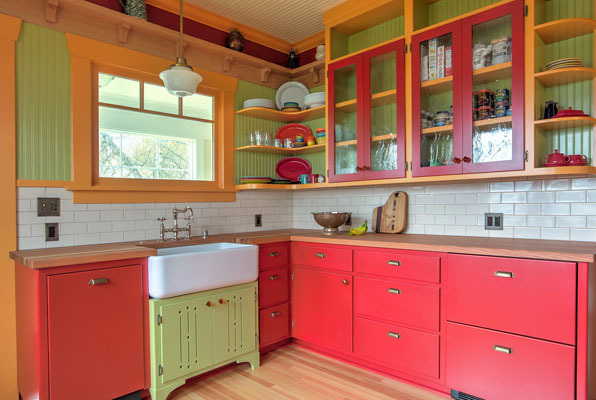 With rich color choices and a really creative approach, this funky old kitchen has had an incredible makeover. 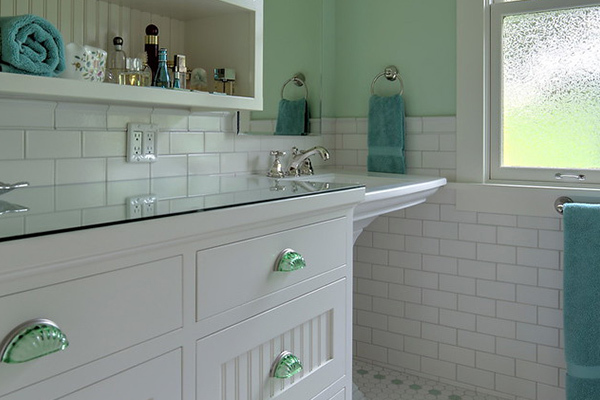 The magic is in the details: locally crafted cabinets with partial overlay doors and s-curved shelves, a vintage sink, custom grooved countertops, and toe kick storage make the space sing. Appliances and modern conveniences were hidden behind panels to open up the space and make it cooking friendly. 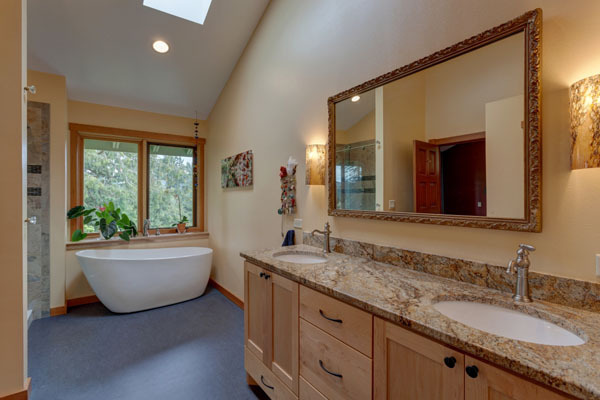 The bathroom was remodeled from floor to ceiling and expanded as well, allowing for more storage and an exquisite barrier free shower. The team included aging in place design elements and prioritized green, durable materials that were locally-made, recyclable and toxin free. The Bright Green project is beautiful, healthy, comfortable and durable. It’s super green too. 4 Ways to Purchase Your Tickets!